Beautiful 1/2" silver chalice pendant on a 16" chain or 16" black cord. A lovely gift for any Unitarian Universalist on your list! 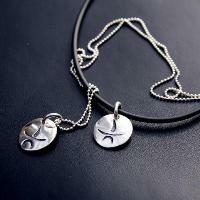 Sterling silver necklace that has been hand stamped with an original design honoring the chalice. The 1/2" medallion shown is approximately 1/2" in diameter and is oxidized, polished and then slightly domed. It is on a 16" long 1mm sterling silver bead chain or a 16" black rubber cord with a sterling silver clasp.